2draw.net - boards - Intermediate - The scary, 'naked' man. He's waiting in line to renew his drivers license. Based off an actual pencil drawing I did a while back. I just gotta say..I mean come on... Is that cool er what? I love the pencil sketch look of all of your works. O_O I just wanna curl up and die right now. This is... whoa! This is definitely my favorite from yours. I shall make this as my wallpaper! Hey, I think I actually like this one. I'm not too big of a fan of all the floating abstract designs, but I like these mutated human being type drawings, so I think I'd like to see more of these. This is just totally awesome.Love the anatomy/muscle definition. Very awesome. I was looking through some proportion books, and your style is close to the style in the book. The coloring and style is close. I tried to draw some and haven't had as much success. Congrats. thats very cool. 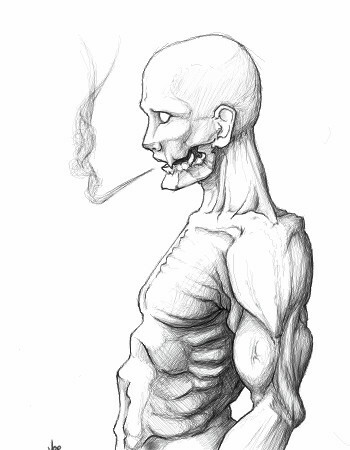 looks like a pencil sketch anatomy drawing. wow, love how non digital it looks, great work. this is awsome.. nice work! That's awesome. Who ever thought a creepy naked guy could look that good?